The summertime, the sun, the heat, the blossoming of flowers, wait… are those zucchini blossoms? Mmm, I love zucchini blossoms. The ever-so-delicate flavor of the blossoms whisper summer to me and visions of my grandmother flood my mind. We look forward to the special time of year as the blossoms are only available during a short time, in fact. They’re difficult to find in regular grocery stores and rare to find in specialty stores, so if you see them pick up a pack or two. This is seasonal cooking at it’s finest, if you miss the window of opportunity, you miss it until next year. 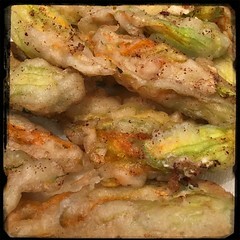 This recipe for ricotta stuffed blossoms is a classic and one of the most common ways to use the blossoms, other variations include the classic Fritters (Frittelle Fiori d’Zucca), Risotto (Risotto ai Fiori di Zucca), pizza (as a topping) and pasta! 1. Remove stems, receptacle (base), spiny ‘sepals’ and pistils leaving only the petals. 2. The best way to clean the delicate zucchini flower blossoms are to dip them into a bowl of water and then let them dry on paper towels. 1. Prepare the Ricotta Mixture and blossoms. 2. Combine flour, salt and seltzer in a large bowl and mix well (don’t mix too fast). 3. Gently open the flowers an put the ricotta mixture inside, depending on how big the blossoms are it would be from about 1/2 tsp up to 2 tsp. Twist the ends of the petals to seal. 4. Use a medium sized frying pan, fill about 1/4 – 1/2 inches with avocado oil and set heat to medium/high to achieve 350F (approx.). 5. Once the oil reached temperature, dip the stuffed zucchini blossoms into the batter (let the excess batter to drip off) and place gently into pan. 6 Fry each flower for approximately 3 minutes each side, rotate and them place on paper towels to dry. 5. Serve HOT! If there are leftovers, we suggest you reheat them in an oven.